On the one hand, anti-American Americans love to tweak patriotic U.S. citizens for their “parochial” leanings. At the same time, they are convinced “bitter clingers” are as dumb as oxen. And while many (leftists and rightists) are not up to snuff on the ins and outs of historical documents, others are. 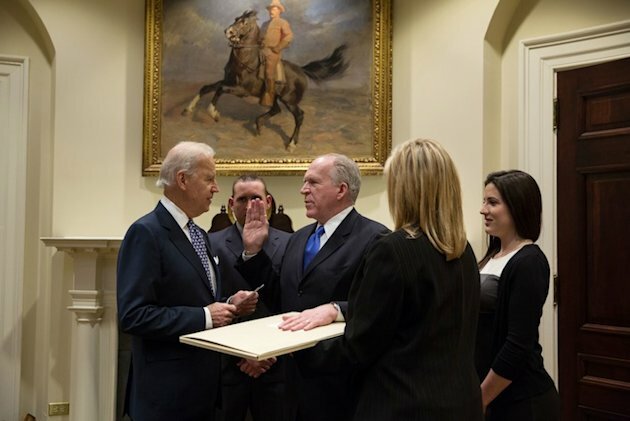 Equally tangential, it is impossible to believe – on any planet – that the swearing in of John Brennan on the draft Constitution, BEFORE the Bill of Rights was enshrined, was not meant as another forward march towards tyranny – adinakutnicki.com/2013/02/15/u-s-leaders-forward-march-towards-tyranny-conditioning-its-citizens-in-the-process-commentary-by-adina-kutnicki/. Appallingly, the sheep in wolves clothing blathered otherwise. They would have us dummies believe, oh yeah, unicorns are alive, pigs do fly, Santa Claus is real and this blogger is a leftist! All of the above are fairy tales. But never mind. This is the authentic John Brennan, in all his treachery – adinakutnicki.com/2013/02/11/john-brennan-obamas-cia-pick-is-a-muslim-convert-brotherhood-mafias-infiltration-near-complete-commentary-by-adina-kutnicki/…as he takes his oath to protect America, at the same time that he is a Muslim convert! What gall. In conjunction, the intersection between Brennan and the Islamist-in-Chief dovetails with a “mysterious” death – adinakutnicki.com/2013/01/13/the-intersection-between-john-brennan-nominated-as-cia-director-a-mysterious-death-during-obamas-first-term-commentary-by-adina-kutnicki/…an actual body of lies. Yet, the above revelations aren’t shocking, when one internalizes that Washington’s counter-terror officials have been compromised for years, but much more so under the reign of Obama – adinakutnicki.com/2012/11/22/what-happens-when-washington-counter-terror-officials-past-present-align-with-muslim-brotherhood-mafia-fronts-commentary-by-adina-kutnicki/ . Back to the (dastardly) swearing in…. It comes to a point, a national fork in the road – so to speak – whereby a leadership has to be informed – ENOUGH! Not by a few outspoken conservatives, but by a massive flood of citizens. Their numbers must be so huge, it will then become impossible to ignore their outrage. So much so, that ignoring the will of these dissenters will threaten their hegemony. IF anyone believes that Brennan’s “symbolic” gesture was meaningless, then these same Americans would do well to prepare themselves for totalitarian rule. For once the leaders realize that the Constitution, the Bill of Rights, is really viewed by most as relics of the past, rest assured, they will be trampling upon a heck of a lot more than historical documents. This entry was posted in Uncategorized and tagged Adina Kutnicki: John Brennan Obama's CIA Pick Is A Muslim Convert, Adina Kutnicki: The Intersection Between Brennan & A Mysterious Death.Yahoo News: Brennan Takes Oath on Draft Constitution-Without Bill Of Rights!, Adina Kutnicki: US Leaders Forward March Towards Tyranny by Adina Kutnicki. Bookmark the permalink. I thank you for all your hard work. I think at least 49percent of us get it, there is not much hope for the hypocritical progs and libs. If America had not forsaken God we would not be in this mess now. Think about it babylon,medio persians,greece,rome,greece present day, and on and on. All of this is predicted in the Bible. God has warned over and over about forsaking Him yet that is what we have now. atheist, witchcraft and its all about me. Our country has gone from a shining example to a pile of absolute filth. Whats right is wrong and whats wrong is right. I will continue to pray to God for mercy for His people all around the world. The enemies of God will be judged by Him in the end. God bless you Adina for giving us the knowledge of what is going on under our noses. I will continue to watch and pray for our country and Israel and for you! Brennan’s a Muslim and the Bill of Rights is definitely not in tune with shariah law. Ergo, it had to be left out. Our senators have abandoned their constitutional duty to advise and consent to presidential appointees only after close questioning revealed the candidates views were compatible with the US Constitution.